“I am human too; I am a wife, mother of seven children and a midwife. I am the only midwife in a primary healthcare facility that serves three communities with a [total] population of 10,000 in Niger State, Nigeria. My days are taxing, and my nights are short,” Hajiya Habiba explained to packed room during a community dialogue arranged by White Ribbon Alliance Nigeria (WRA Nigeria). Hajiya is the community midwife in a primary healthcare center covering two-three communities, which serves 2,650 patients and approximately 165 births in a single year. They have no doctor. She works an average of 10 hours a day and is available for all emergencies, seven days a week. Hajiya is assisted by an unskilled attendant who helps ensure the clients are, at minimum, attended to. Hajiya’s heavy workload means clients must often wait long periods of time for her to attend to them. She sometimes moves from one patient to the next, leaving the delivery room to attend to other patients while juggling other health center responsibilities. Sometimes there are no beds for admitted patients, forcing her to find makeshift beds, or sometimes, attend to them on the floor. Hajiya goes home mentally and physically exhausted every day, yet she is still expected to cook and care for her family’s needs, which is often interrupted by emergencies from the clinic, sending her back to work at odd hours. Her relationship with her husband is strained, her daughters question her priorities and her in-laws see her as inattentive and careless. Hajiya recognizes that her reputation is not necessarily golden, either. The weight of trying to do her job without basic support and supplies leaves her short tempered, uncooperative and slow with patients and their relatives. She often has no recourse but to refer them to the general clinic, which is hours away, when she is overwhelmed or lacks resources to attend to specific needs. Described by some community members as the “witch of the village,” many women in the village believe they get better and more personalized care from unskilled birth attendants at home than in the primary healthcare center with Hajiya. 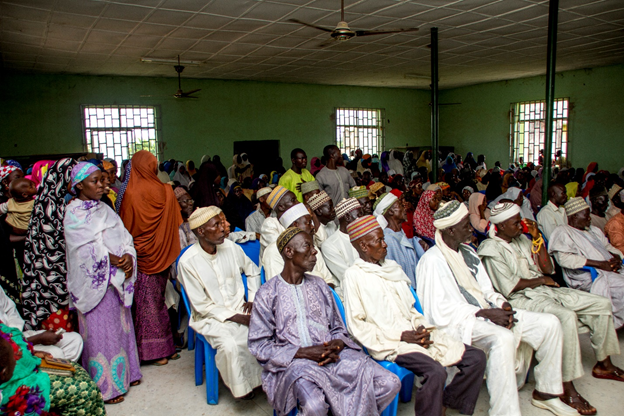 WRA Nigeria invited Hajiya and others to a community dialogue to discuss to discuss challenges to providing quality maternal, newborn and child healthcare with community leaders. The community members identified their dissatisfaction with health care services in the primary health center, prominent among which were inefficient services, slow response to patient needs, poor facilities and the lack of empathy on the part of the health care providers. They complained that the Government had promised free services, but Hajiya still requested payment for drugs and commodities to render services to villagers. Hajiya thanked them for their feedback and openly responded. WRA Nigeria representatives thanked all parties and explained how citizens can bring change to their communities by engaging the government through established and acceptable channels. As the convener of the community dialogue, WRA Nigeria believes that engaging citizens is critical to identifying challenges and context-based solutions to health needs of citizens and communities. Additionally, increased responsiveness from government to the demands of citizens can lead to an increase in utilization of health facilities and generally improve maternal, newborn and child health service delivery. Ore Ololuwa, WRA Nigeria senior program manager, encouraged community leaders and Ward Health Development Committee members to act. “You could use your position to influence the government to respond to your demands. There is a lot that your positions can do to bring the change you are clamoring for,” she said. For the first time, Hajiya felt understood and that her voice was heard by the community. Following the October community dialogue, WRA Nigeria members and community leaders started to plan a townhall meeting with government officials, which took place December 10, 2017. Officers from the State Government on Primary Health Care and State Planning Agencies attended, along with community leaders, Hajiya and youth groups. The government representatives thanked the conveners of the meeting and explained that government is there to serve the needs of the people. They expressed appreciation enlightening them on the challenges and needs of the people and assured everyone present the issues raised will be looked into. Importantly, a follow-up plan was agreed upon by all present for the next six months. Following the meeting and further advocacy visits by the WRA Nigeria team and community leaders, the government committed to then hired 100 midwives across all the state primary health care centers, and they are currently in the process of deploying and readying them for their service. This is a significant step that will ultimately reach many more people than WRA Nigeria had anticipated. Nigeria loses about 2,300 children under-five years old and 145 women of child bearing age every day, giving it the highest under-five and maternal mortality rate in the world (UNICEF-2015). Poor access and utilization of facilities are main barriers to reproductive, maternal, newborn and child health (RMNCH) in Nigeria. Interventions to reduce maternal mortality emphasize an increase government response to commitments made relating to RMNCH. One way of accessing and increasing government response is through citizen-led accountability processes. WRA Nigeria’s bottom-up and top-down approach works with stakeholders to create platforms for dialogue and working with government ministries to ensure that their investments in health reflect the needs of communities and people. By connecting people to their governments, advocating that the targets of government interventions — people — are heard, and information from people shape how policies are formulated and implemented. For the first time in four years Hajiya will soon be working with three other midwives at her health center, increasing the total number of available skilled birth attendants for a population of 10,000 people from one to four. Although this is far from the WHO recommendation of one midwife for every 175 women of childbearing age, for Hajiya is happy for this significant improvement and important step in the right direction.